What is a Stand Alone Will? 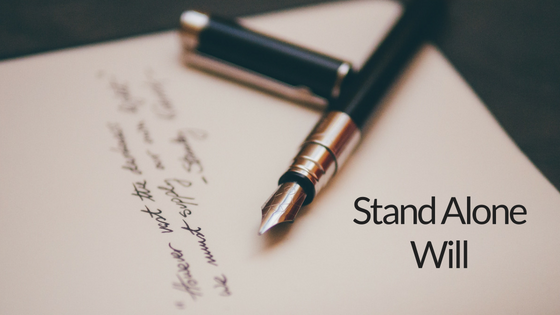 A stand alone will is one of the three different types of wills. The other two pour over wills and living wills. A stand alone will can accompany a living trust. Together, these two documents can make for a viable estate planning strategy that lets you address non-trust assets. This type of will allows you the ability to name the individuals who will take over your estate. It helps you specify instructions on how to distribute your possessions. Another benefit is that it lets you nominate individuals who can act as guardians for your children. A stand-alone will goes into effect immediately upon your death. When you create a living trust, not all assets will make into the trust. These items can include things like vehicles, personal possessions, and checking and savings accounts that are only under your name. If the wish of the decedent is to have these items kept out of the trust, then a stand-alone will becomes a significant document. California law does not require probate court to get involved with small estates. California considers small estates as those under $150,000. If the decedent has unpaid debt, creditors can hold beneficiaries liable. A stand-alone will can help protect beneficiaries of non-trust items if creditors decide to open up a case against them. While it does not guarantee that they will drop all debts and remove liability, a stand-alone will can ensure that beneficiaries get treated fairly in court. Of course, this is under the assumption that they feel it’s worthwhile to open up legal proceedings against heirs for unpaid debt by the decedent. A stand alone will becomes an essential estate planning document. This is especially true if you find yourself in a scenario where you have substantial debt and many valuable items that you leave out of the trust. If you fail to plan for these non-trust items, and your descendants decide to take ownership of them after your death, it can turn into a precarious situation. The best solution is to consider whether you should include a stand-alone will as part of your estate planning. In this way, you are covering every valuable possession under your ownership. An experienced estate planning attorney can help you figure out if a stand-alone will would be beneficial for you and use it as a part of a comprehensive estate plan. Contact us today for an estate planning consultation.